At the junction, take a left on the South Fork Cascade Canyon Trail where you quickly come to a wonderful cascade. The trail switchbacks up into the canyon as it roughly follows the creek. This section travels mostly through trees with a couple of bridged creek crossings. A few spectacular vantages of the surrounding towering walls interrupt the forest. The trail continues along the endless cascades of the babbling creek into the granite ravines. The dense forest of the lower elevations gives way to scattered trees in a subalpine landscape. The surrounding mountains of the canyon become more visible. The waterfalls and panoramic views are occasionally broken up by forests as the trail levels off. Past a pond, the trail steeply switchbacks up a slope and into a fairly treeless expanse. The trail for Avalanche Divide takes off to the left while the trail to Hurricane Pass continues to the right. (See Avalanche Divide for description.) Alternating between flower-lined streams and barren, rocky landscapes, you switchback up to an unbelievable expanse. 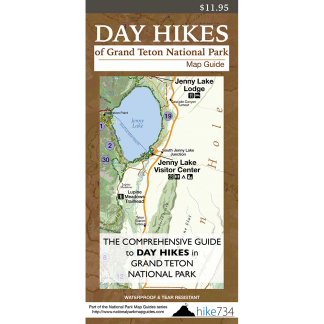 The incredible panorama includes Hurricane Pass and Schoolroom Glacier to the southwest, Avalanche Divide and South Teton to the southeast, and over to Middle Teton and Grand Teton to the east. The moraines create a gray, gnarled moonscape terrain. The trail continues, through meadows of low-growing shrubs and numerous flowers, to the base of a moraine that has trapped an emerald lake fed by Schoolroom Glacier. The trail switchbacks up, giving you better vantages and brings you close to the glacier, before heading up to Hurricane Pass. 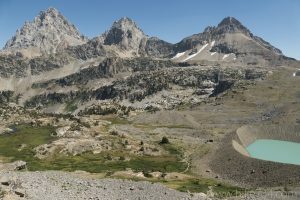 The views from the pass are of the Tetons and the South Fork Cascade Canyon to the east, and the vast expanse into the Jedediah Smith Wilderness to the west. This is a perfect place to have lunch before heading back.